In this recipe, we add some wonderfully sticky honey so that the grains hold together as they bake. 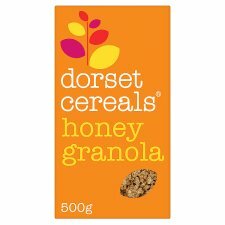 It also makes sure the finished granola is brilliantly crunchy and moreish. So, go on, bake some biscuits, be a tourist in your own town, write a poem, spend a day in the wilderness. Because when you savour the present, life suddenly becomes far more delicious. Play our Spin the Bottle game and you could win wonderful prizes every day. We're talking everything from a week off to pottery lessons. And don't worry, you won't have to kiss anyone. Store in a cool, dry place., Once opened, roll inner bag down tightly and eat within one month., For best before end date, see base of pack.